Xanthie, like the other three kiddos, has a dairy allergy and since she is still nursing I’m off diary too It’s SO hard! I REALLY miss cream in my coffee and cheese! The world is such a better place with these foods! I’ve now been off of them for about 3 or 4 months and the cravings have NOT ceased…. That could be for a few different reasons…because I love it and miss it… and maybe because I’m pregnant again! I’m about 10 weeks now and food cravings are alive and well! And of course cheese is one of them! SO frustrating!!! But there are certainly worse things! Also, as per my usual I’m craving anything salty and carbs in general. I know, I know… craving salt usually indicates a need for increased fluids and cravings for carbs often indicate a need for protein. That does sometimes help, but the craving is still there! Then… today… I happened across a gluten free dairy free cheese sauce and I was determined to give it a try! I know I haven’t had cheese in 3+ months and this wasn’t particularly cheese, but it was actually surprisingly close and really tasty! 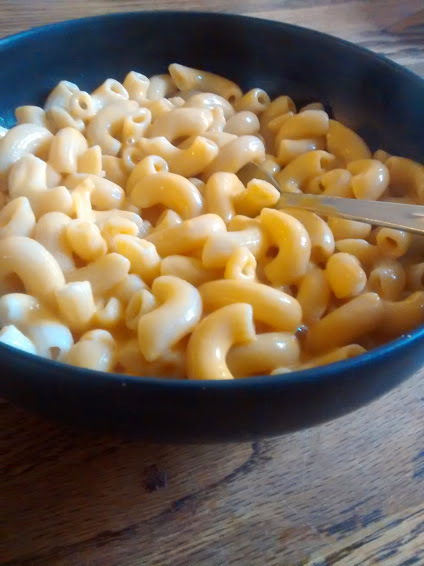 I will say it satisfied the craving for mac n’ cheese today! 😉 And THAT… is pretty impressive! This is definitely going to be on my repeat list and hopefully I won’t repeat it too frequently that the kids start to veto it! Oh! And they enjoyed it too. Tonchi said “Mom! This looks just like the kind we used to buy at the store! But, it doesn’t taste exactly like it.” True…. but they liked it! And so did I! We usually use corn pasta and our favorite brand is [amazon_link id=”B000FK7PQW” target=”_blank” container=”” container_class=”” ]Tinkyada Brown Rice Elbows with Rice Bran[/amazon_link]. They are easy too cook and usually only take 10 or 15 minutes to get on the table…. just about the same time to cook as to mix up the sauce. So a great quick lunch option! Place all ingredients from the water through the salt into the Vitamix container. Mix on high for 6-7 minutes or until heavy steam is escaping from under the lid. Reduce spead and add in boiling water and startch mixture. It’s just the right amount for one 16oz bag of corn pasta. Try it out and let me know how it is! I hope you enjoy it as much as we do! Yeast? Like regular old bread baking yeast? Not nutritional yeast? Sounds yummy. We will have to try it someday! Yes! Just the old regular yeast. Just seeing this!! You are pregnant!! Congrats!! Wow, how exciting! !